In the Zeitlin School in Central Tel Aviv, you’ll find our first friendly house of worship that opened its doors to all who seek a synagogue to call their own. This liberal Orthodox synagogue welcomes everyone, and a great number of non-trGoren Shuaditional families come to pray here as well, including members from the LGBTQ community. It offers weekly Shabbat services and services for the High Holy Days. Yachad will warmly welcome you too. This flourishing community was founded in 1991, with three progressive reform centers: Beit Daniel in northern Tel Aviv, Mishkenot Ruth Daniel in Jaffa, and Kehilat Halev in central Tel Aviv. The goal of the Daniel Centers is to be a positive force that brings egalitarian, inclusive, and modern Judaism to Tel Aviv-Jaffa, and to offer a progressive cultural and spiritual alternative to Orthodoxy that is equally traditional but also mindful of the needs of Jews living in a modern secular society. They offer religious services, various educational programs, an immersive volunteer-learning program, a pluralistic Jewish curriculum for local secular public schools, as well as an artistic-educational project and exhibition that promotes pluralism and coexistence in dozens of schools throughout Israel, and much more. Located in Central Tel Aviv, just east of the Shalom Tower, the Great Synagogue is one of the most beautiful synagogues in Tel Aviv. It was completed in 1926, and due to the 1960s emigration of local residents, it was forgotten for a while, with very few people attending services here. However, there is an ongoing effort to bring people back to the Great Synagogue. You can be one of 350 people to enjoy the bi-monthly Friday night meals here. Weekly minyanim on Shabbat day and Kabbalat Shabbats have resumed as well. Also, many public figures have decided to get married at the Great Synagogue. 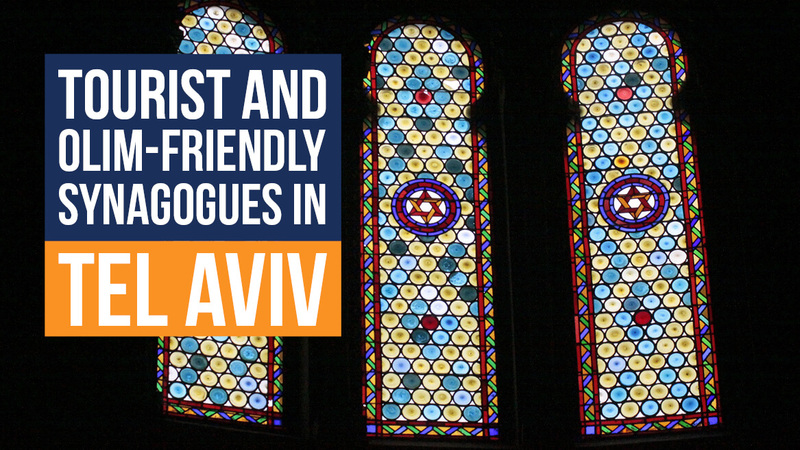 Built in 1931 and housed at the historic Beit El Synagogue, the Tel Aviv International Synagogue is one of the five oldest synagogues in Tel Aviv. It’s a lively Modern Orthodox synagogue where the service is conducted in English and Hebrew. TAIS is based on acceptance and mutual respect, and it welcomes Jews of all backgrounds to come and enjoy the diverse and dynamic spiritual, cultural, social, and educational programs and services. It already has a large community that includes singles, couples, families, tourists, olim, and Israelis – thousands of Jews from all backgrounds and from over thirty countries of the world. The North Central Synagogue and Community Center is another ideal and diverse community for internationals and Israelis, both English and Hebrew speakers, to become a part of. Everybody is welcome! Regardless of your observances and your familiarity with Jewish traditions, you can enjoy a variety of spiritual, cultural, and educational programs here, including the large social Friday night Shabbat dinners for young professionals from around the world. Ichud Shivat Zion is a large beautiful synagogue on Ben Yehuda and home to several communities, including Minyan Ichud Olam – a growing, diverse, and dynamic Modern Orthodox community of young families and professionals from many different countries and cultures – internationals and native Israelis – and from all across the religious spectrum. They take pride in being an open, warm, and friendly community that is promoting a dialogue between the religious and the secular aspects of society; a community that offers numerous religious, social, communal, and educational activities, where all Jews are welcome, and where different expressions of Yiddishkeit are encouraged. They have special services for French and Italian Communities on the second floor as well. Chabad on the Coast is Tel Aviv’s first English speaking Chabad House and it still serves the English speaking community. As they state on their website, their goal is “to infuse Tel Aviv with vibrant Jewish life”, to inspire Jews everywhere, to learn together, grow together, and connect to their Jewish heritage. They organize various social events, Torah classes, Shabbat and holiday services and meals, events for young professionals, many children’s programs, and much more. Rabbi Eli and Rebbetzin Sara Naiditich always keep the door open, providing a welcoming atmosphere for every Jew, from every geographical and cultural background.